Grab a coffee or tea and join us each Friday, to learn how these Soak worthy bags came to be. Are you bagged? Send us your favorite bag. 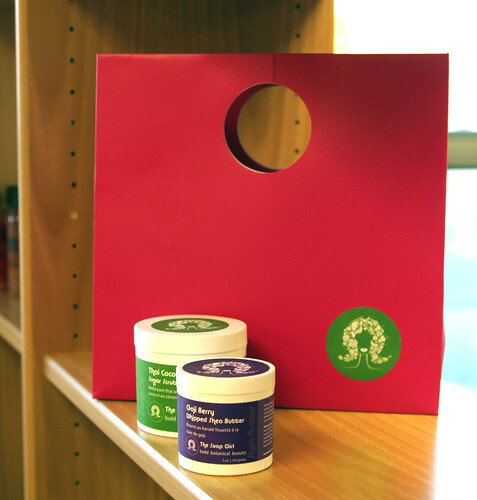 If we feature it here, we’ll send you a Soak gift pack, in a pretty bag, of course! A few weeks ago, Jacqueline brought this chic and bold pink bag into the office. Sarah Crawley, a-stay-at-home mom and Canadian entrepreneur, started making bath bombs in 1999. A decade later, her company, The Soap Girl, has expanded to include soaps, butters, masques, and scrubs. Sarah uses only ingredients that she understands resulting in products made with natural ingredients that are Phthalate free, paraben free, and synthetic dye free. She also opts for ethically produced and organic ingredients whenever possible. You will start to see her products more often as she is now selling through wholesellers as her business expands. After meeting up with her to talk shop and business, she left us with some great goodies: the Thai Coconut and Lime Sugar Scrub and the Goji Berry Whipped Shea Butter. Thanks – I love this!